It’s easy to think that buying dog food is a simple process: you check whether the label indicates your dog’s breed and age and if it does you buy it. However, that’s not always the best way to go, because there are lots of dog food products that seem healthy based on the cover, but are actually lacking in nutritional value. Do not worry though, in this article, we shall explain to you all the factors you need to think about while buying dog food, and to make the process of choosing even easier for you, we shall also include a list of the top 10 best dog foods you can buy online in India. Many dog food will claim that their products will make your furry friends happier and healthier, but in order to make sure that they’re actually going to live up to their promise, you can check for a few things before you buy the product. One of the first things you need to consider is the size of the breed because nutritional needs can be very different for larger dogs and smaller dogs. Larger breeds become adults much faster, which means they also reach the senior stage more quickly. While smaller dogs remain younger for longer and have a faster metabolism that needs to working out to stay healthy. Due to these reasons, larger breeds need to have a diet filled with omega-3, glucosamine, omega-6, in order to keep their joints and bones in the best condition, while smaller breeds need a diet rich in protein, fat, as well as easily digestible carbs, to keep their metabolism running. Big dogs are not too picky about the size of their food, but small dogs tend to prefer small, bite-sized pieces. If it were humans, would it seem fair to give the same kind of food to babies and adults? The same logic applies to dogs too, as puppies and older dogs have very different nutritional needs. Therefore, when you’re choosing dog food, you must keep your dog’s age and its nutritional needs in mind, and choose something accordingly. Puppies need a lot more calories, vitamins, protein, and minerals, because not only are they growing, they also spend a lot more time running around. Older dogs wouldn’t be able to stay healthy with such a heavy diet though and need more fatty acids like omega-3, as well as vitamins and minerals like glucosamine and chondroitin to keep their ageing bones and joints healthier. While both pregnant dogs and lactating dogs eat a lot more than usual, there is a wee bit of difference in their nutritional needs. 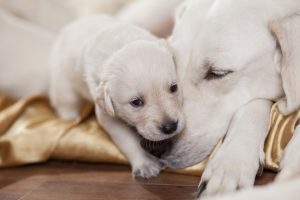 Pregnant dogs can continue eating their regular dog food, just in slightly larger amounts, about 25% to 50% more, but lactating ones would do better with a heavier alternative, such as puppy food. Although, once the puppies start weaning, you must gradually switch back to your dog’s normal feeding routine. 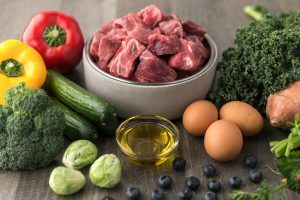 Meat and eggs are two of the most important sources of protein and amino acids for dogs, so it’s important that the list of ingredients has at least one or two whole meats mentioned as the first few ingredients. The kind of meat should be mentioned specifically, such as chicken, liver, or chicken meal, confirming that it is wholesome and nutritious. Vegetables and easy to digest grains are the main sources of vitamins, minerals, and carbs, and while most vegetables work well in their diets, it is the grains bit you need to be careful about. Look for grains like rice, oatmeal, millet, amaranth, or even vegetables like potato and sweet potato, to fulfil your dog’s carbohydrates requirements, as all of these are easy to digest for dogs. Artificial preservatives are not the best for your dog’s health and are only added to make the shelf life of dog food longer than it would naturally be. 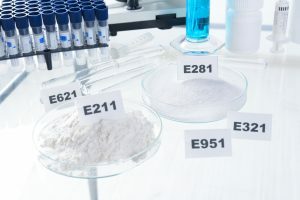 Keep an eye out for ingredients like BHA (Butylated hydroxyanisole), BHT (Butylated hydroxytoluene), Propylene glycol, and Ethoxyquin; they’re the most commonly used artificial preservatives. Another ingredient that is completely unnecessary in dog food is an artificial colouring agent. Dogs really don’t care what colour their food is, and these chemicals can often upset their health. They’re added mostly because the ingredients used in the dog food are not of optimum quality, and need artificial colours to make them appear more appealing to dog owners. There are a quite a few ingredients you should either completely avoid, or at least make sure that they’re not mentioned as the first couple of ingredients on your dog food; these include meat by-products, cereal by-products “animal” fat, sugar, and artificial sweeteners. Meat by-product can mean anything from feathers to eyeballs to feet, so we recommend either avoiding it or making sure it’s not part of the top five ingredients. 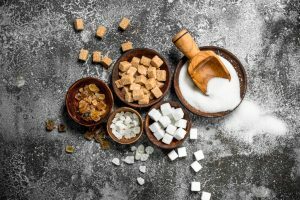 Same goes for cereal by-products; they often include things like grain husks, fermentation waste from mills, and occasionally even wood particles. You must also stay away from foods that mention “animal” fat, as that term is too vague, and could mean recycled fat from unknown sources. Sugar and artificial sweeteners should be limited because just as they add unwanted calories for humans, they do the same for dogs. Now that you’re ready with all the information you need, let us reveal our picks for the top 10 best dog foods you can buy online in India. Remember to check all the aspects we mentioned earlier to make sure you choose the most suitable one for your buddies. 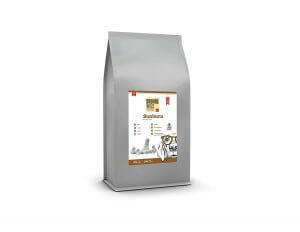 Among the healthier dog foods, this is the most affordable product on the market, without any corn or wheat in the mix. With fresh chicken and whole dried eggs as the main protein sources, and rice and oatmeal as the main carbs, this kibble provides all the necessary amount of nutrients that an adult dog needs. It’s not the best choice for dogs with sensitive stomachs, as well as those who fall ill easily while transitioning to new foods, as this could cause diarrhoea for them. Additionally, the meat mentioned is fresh meat, so the 40% would become much lesser in amount once it loses the moisture content. 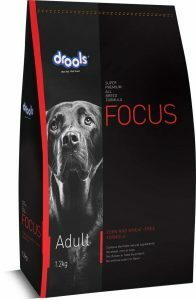 If you’ve got a lactating dog with a litter always eagerly waiting for a feeding, then this is the dog food you need. It contains 32% crude protein and 20% fat, which will allow both the lactating mother, as well as her weaning pups to meet their high energy requirements. It does have corn as its third main ingredient, and therefore it could be unsuitable for dogs with sensitive stomachs, as corn is harder to digest. Additionally, it also contains chicken digest, could potentially be unhealthy if it contains unnecessary chemicals. 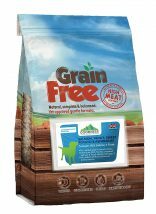 This is the best option for adult dogs who happen to be allergic to animal proteins; it is soy based, with 27% crude protein, making it, unlike any other plant-based dog foods, as it actually fulfils the nutritional needs. It also doesn’t have the typical stink associated with dog food, making it a delight for the humans serving it as well. It does, however, contain corn, so if your dog usually has trouble digesting it, then you should avoid this. It also takes the dogs longer to get accustomed to this dog food compared to others. Furthermore, this kibble is a bit hard, so it could be difficult to chew for older dogs. Those looking for a healthy yet budget friendly dog food option for their large breed puppies should consider getting this one. It has dehydrated chicken as its main source of protein, rice for carbohydrates, as well as added glucosamine and chondroitin to make sure the puppies develop healthy bones and joints. Just like many other economical options though, it does contain corn, therefore, it could potentially be difficult to digest. 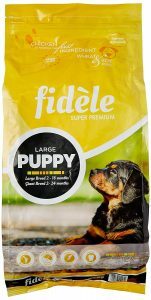 The size of the kibble is also quite large, so we would only recommend it to slightly older puppies unless your little ones are comfortable with having tougher kibble as well. 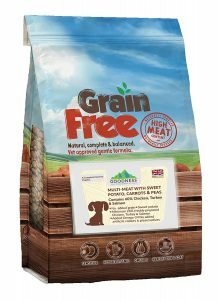 This 4 kg pack is one of the healthiest dog food options available at an affordable rate. It contains healthy sources of protein and carbs such as fresh chicken, dried eggs, potatoes, and oatmeal, and within a few months, you’ll be able to notice significant improvements in the health, as well as the appearance of your dogs. Although the kibble is sized appropriately, it is slighter harder than usual, so it could be difficult for the dogs to eat it, and get used to it. In order to make that easier though, we would suggest making a little extra effort, and mixing it with water, to make sure it is soft enough to eat, without too much labour. If you’re looking for a nutrient-dense option for a lactating mother and her litter, then this is the one for you. It comprises of chicken, turkey, and salmon as the main meat components, and sweet potato and potato as the carbs. You’ll be able to observe visible differences in your dogs’ health as their fur becomes more lustrous. Do remember, this is for dogs that require high amounts of nutrition, and it can be too heavy for others, so make sure you limit it to puppies and their lactating mothers. Additionally, it’s great that this kibble is grain-free so there are fewer chances of allergies and upset stomachs, but it does make it quite an expensive product. 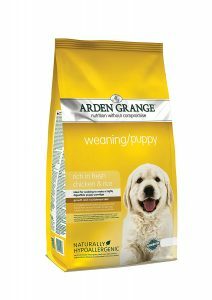 This is the best option for medium breed puppies with sensitive stomachs. It comes 35% crude protein, which is perfect for these slightly larger puppies who need a lot of energy as they prance around. 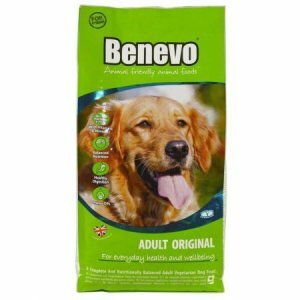 It is free of beans and peas to keep their digestive systems healthy and is recommended for puppies suffering from loose stools. The kibble size is a bit big though, so if the puppies are still quite young, they might have some difficulty eating this. Furthermore, while it is one of the best dog foods, with healthier grains instead of things like corn, it is pretty expensive, especially since medium breed puppies have a fairly large appetite. 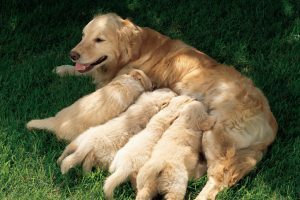 Those looking for the best dog food option for a lactating mother and her puppies, need not look any further, as this is it. 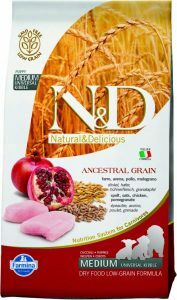 This product is more than 50% meat, with extremely healthy and delectable sources such as duck and turkey. As for the carbs, instead of using corn or wheat, it has brown and white rice as the main sources. Aside from lactating mothers and her litter, this is also highly recommended for adult dogs who are really active, engaging rigorous physical activity every day, as it provides 30% crude protein. Additionally, it helps improve digestion and makes sure that if the dogs are suffering from loose stools, their condition becomes better soon. 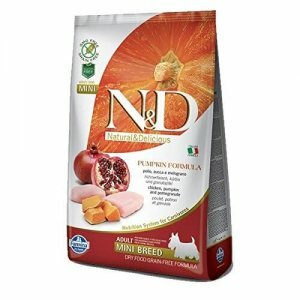 There aren’t too many healthy options for mini breeds, so if you’re someone looking for high-quality dog food for your little friend, then this is the one you should get. This product is grain-free, gluten-free, and hypoallergenic, so it is gentle enough for those with sensitive stomachs, as well as those prone to skin allergies. It contains 30% crude protein, which is great for maintaining the high metabolisms of mini breeds and keep them running with lots of energy. The size of this kibble is also perfect, and it isn’t too hard either, so it makes chewing easier for them. Furthermore, it’ll help remain active, maintain a healthy weight, and make their fur shine! 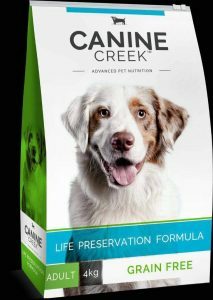 The best dog food on the market, this is especially great for active adult dogs who need quite a bit of energy to remain active, but from healthy sources, so they don’t become overweight. This product contains high amounts of salmon, trout, and sweet potato, all of which are full of nutrients like amino acids, omega-3, and complex carbs. It is also really easy to digest, so it won’t upset the gentle stomachs of smaller breeds, while still meeting the nutritional requirements of both larger breeds and smaller breeds. The kibble size works for both too, and it not only keeps them healthier on the inside but makes their skin and coat more lustrous too! Many owners simply buy the more advertised dog foods, and even those who try to be thorough by checking reviews online, tend to forget that independent research is equally important. In the case of dog food, in particular, it is the lesser known ones that are often the healthier varieties. We hope our article has informed you on all the things you need to check for while buying dog food, and you’ll now be able to choose healthier options for your loyal companions. We also hope that our list of recommendations helped you find something that fits your dogs’ needs, and made it easier for you to purchase it as well!